Delivery: Dispatched by email in 1-2 business days. If you are looking for an Authentic Coat of Arms, by a company that is recommended by the National Library of Congress, and who have a reputation second-to-none then this is what you need. Your surname is researched by our Historians from our massive library of books, and then illustrated using the latest technology combined with the traditions of 100's of years ago, by one of our Master Illustrators. We never invent a coats of arms, and we can guarantee that every coat of arms is authentic. We pride ourselves upon our honesty and have built our growing customer base upon these same principles. Want to design your own wedding stationery for a fraction of the price? Or why not make your own unique personalized note paper, and be the talk of all your friends and family, whatever your reason, you will be impressed with the outstanding beauty of the fine lines, bold colors, and two authentic coats of arms combined to create one, we take the shields of both arms to create one quartered shield, and place both crests above their own facing helmets. 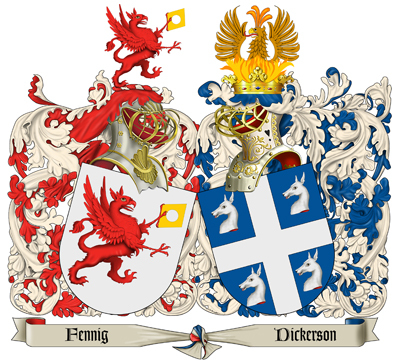 Q. Whats the difference between a Coat of Arms & Family Crest?